China may export deflation to the rest of the world. Japan is mired in deflation. Economists are afraid that deflation will hit Hong Kong. RBS has advised clients to brace for a “cataclysmic year” and a global deflationary crisis, warning that major stock markets could fall by a fifth and oil may plummet to $16 a barrel. Andrew Roberts, the bank’s research chief for European economics and rates, said that global trade and loans are contracting, a nasty cocktail for corporate balance sheets and equity earnings. Lower oil prices could push leading economies into deflation. Just look at the latest inflation rates – calculated before oil fell below $30 a barrel. In the UK and France, inflation is running at an almost invisible 0.2 per cent per annum; Germany is at 0.3 per cent and the US at 0.5 per cent. Almost certainly these annual rates will soon fall below zero and so, at the very least, we shall be experiencing ‘technical’ deflation. Technical deflation is a short period of gently falling prices that does no harm. The real thing works like a doomsday machine and engenders a downward spiral that is difficult to stop and brings about a 1930s style slump. Referring to the risk of deflation, two American central bankers indicated their worries last week. James Bullard, the head of the St Louis Federal Reserve, said falling inflation expectations were “worrisome”, while Charles Evans of the Chicago Fed, said the situation was “troubling”. Research Team at TDS suggests that the euro area looks set to endure five consecutive months of deflation, starting in February. The further collapse in oil prices and what is likely spillover into core prices means the ECB’s 2016 inflation tracking is likely to be almost a full percentage point below their forecast of just six weeks ago. The U.S. might seem better, but a top analyst said last year: “Core inflation in the US would be just as low as in the Eurozone if measured on the same basis”. Medical prices grew 0.1 percent, versus a decrease of 0.1 percent for all other items, in December’s Consumer Price Index. Trucking freight in the U.S. is in steep decline, with freight companies pointing to a “glut in inventories” and a fall in demand as the culprit. Morgan Stanley’s freight transportation update indicates a collapse in freight demand worse than that seen during 2009. And the velocity of money has crashed far worse than during the Great Depression. Why Didn’t the Central Banks’ Pumping Trillions Into the Economy Prevent Deflation? But how could deflation be threatening the globe when the central banks have pumped many trillions into the world economy? 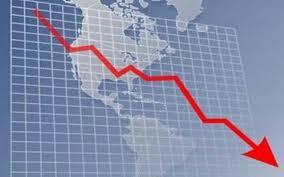 Initially, quantitative easing (QE) – instituted by most central banks worldwide – actually causesDEFLATION. In addition, governments on both sides of the Atlantic have encouraged bank manipulation and fraud to try to paper over their problems. Because fraud was one of the main causes of the Great Depression and the Great Recession, but nothinghas been done to rein in fraud today. And governments have virtually made it official policy not to prosecute fraud. Fraud is an economy-killer, and trying to prevent deflation while allowing a breakdown in the rule of law is like pumping blood into a patient without suturing his gaping wounds. The government also chose to artificially prop up asset prices … while letting the Main Street economy tank. Governments also pretended that massive amounts of public and private debt are healthy and sustainable … but they are not. By choosing the big banks over the little guy, the government has doomed BOTH. In addition, bad government policy has created the worst inequality on record … and inequality is aneconomy-killer. What Do the Economists Say? We asked three outstanding economists why central banks pumping trillions into the world economy hasn’t worked to prevent deflation. The debts were left in place in 2008 instead of being written down. So the economy is now in a classic debt deflation. QE seeks to inflate asset markets, not the real economy. The choice in 2008 was whether to bail out the banks or the economy — and the former were bailed out — the political Donor Class. Economics professor Steve Keen – the Head Of School Of Economics, History & Politics at Kingston University in London – has previously agreed, saying: we’ll have “a never-ending depression unless we repudiate the debt, which never should have been extended in the first place”. In the USA, they’ve simply bought privately created bonds–normally MBSs–off the banks. This shuffles the asset side of the banks’s ledgers (by exchanging government-created money for overvalued private bonds) but doesn’t change the liability side directly–so no money is necessarily created. In the UK, the CB buys those bonds off pension and insurance funds, which does create money–but it creates it in the deposit accounts of companies who are legally obliged to buy assets with that money (shares and other bonds) rather than goods and services produced by the real economy. So QE as practised has been irrelevant to the real economy, leaving the deflationary forces created by the huge private debt bubble to rage on free. Everything that criminology and economics teaches is that if financial elites are allowed to cheat with impunity they will make themselves rich at the people’s expense and corrupt democratic government. Black previously explained that we’ve known for “hundreds of years” that failure to punish white collar criminals creates incentives for more economic crimes and further destruction of the economy in the future.